Ya know what the majority of food sitting on grocery store shelves should be called? "Crap on a shelf"
Hardly anything good is coming out of the food! You can buy these products very easily, with no obligation, it costs nothing to join, buy as much or as little or non at all...Totally up to you! Please get in touch with me if you want to improve your health! Below- My Testimony on Rebound to end cramps from loss of nutrients during heavy sweating workouts jogging and just plain hard work! Get in touch with me please if you would like to try any of these products for a healthier body. Below Video--My testimony on how Tangy Tangerine cut down on eating chips, snack bars and the general crap that comes off the shelves of the stores in this country! I started taking this product back in Jan 2013 and have been amazed to say the least how well it has worked. I started watching what I was eating back about 15 years ago or so, I cut out sugar (like not adding sugar to coffee etc...) and soda, the only time I will have soda is with a mixed drink which is rare but once in awhile I do. So look I started listening to a radio show/internet site Info Wars and first heard about this product on that site. 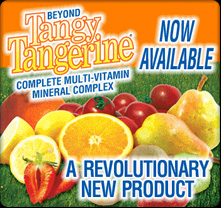 I decided to try the product Tangy Tangerine to fight hunger pains and wow did it work for me. It is amazing how much I have stopped shoving food in my mouth to keep my stomach satisfied. My food bill has gone down, my desire for cookies and chips, instant potatoes to fill a pain is gone. I cannot say that I feel better as I had already been exercising, eating pretty well and working like a nut on an oil rig, but dang has the desire to get something in my stomach diminished.I have just started promoting and selling this product so call me 432-210-4962 or email me charleyenglish@gmail.com if you have any questions or would like to purchase this product.